The safest and simplest technique to observe and photograph the eclipse is to use your telescope (or one side of your binoculars) to project a magnified image of the sun’s disk onto a shaded white piece of cardboard. 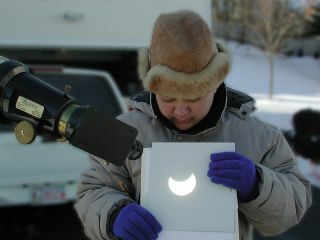 This view was taken near Boston during the partial solar eclipse on Christmas Day 2000. Editor's Note for July 2017: The total solar eclipse of Aug. 21, 2017 will the THE skywatching event of the year, crossing 14 U.S. states as it makes its way from Oregon in the west to South Carolina in the east. Visit our complete coverage for the Great American Solar Eclipse for the latest eclipse news, complete viewing guides and best apps like Eclipse Safari to make the most of your eclipse viewing experience. With a potentially spectacular solar eclipse to grace the skies of the western United States on Sunday (May 20), here's a helpful reminder for new eclipse chasers: Be safe. A fraction of a second of magnified, unfiltered sunlight will sear your eye’s retina irreparably. Imagine a horrible sunburn on your eyeball. Your eye cannot grow new layers and slough off the singed ones like your skin tissue can, so staring directly at the sun is dangerous without the protection of safety equipment used by veteran skywatchers and astronomers. So, practice Safe Sun: Don't ever look directly at it! Not with your eyes, binoculars, and certainly not with a telescope unless you have proper optical filters. Whether there's a solar eclipse or not, direct sunlight harms eyesight. Imelda Joson and Edwin Aguirre captured the May 10, 1994 annular solar eclipse from the eclipse path’s northern limit near Lordsburg, N.M.. They used a filtered 4-inch Meade telescope with a focal length of 1,000 millimeters and Kodak Royal Gold 400 color-negative film. Warning: Sunday's solar eclipse is dangerous! Experienced eclipse chasers watching a total solar eclipse will have a short time — during totality only — when they may view the eclipse directly. Don’t try this unless you are with someone who has done it before and can still see. But don’t try it at all under Sunday's annular solar eclipse. Eclipse or not, always use a proper filter when observing or photographing the sun. Regular sunglasses and photographic polarizing or neutral-density (ND) filters are not safe for use on the sun. If you’re planning to watch a solar eclipse or look for sunspots, what is the proper optical filter material for sun-watching? Eclipse glasses are designed and marketed for exactly this purpose. Shop them online if you have time before the event you’re planning to watch. Your local museum store may stock them. Try and buy them online from a reputable telescope maker (e.g., Orion, Meade, Celestron). If you can get hold of them, welder's goggles rated at 14 or higher will protect your vision. The nice thing about goggles as opposed to glasses: They have straps. They’re not likely to fall off. Less safe is to hold a piece of No. 14 welder's glass up to the sun. Seasoned eclipse observers and astronomers who know what they’re doing sometimes use aluminized Mylar sheeting. The aluminum residue blocks much of the harmful infrared and ultraviolet light. But be sure the material really is aluminized Mylar. And don't use it to jury-rig a filter over binoculars, telescopes or any other kind of lens-based or mirrored device. The best way to attach your digital SLR camera to the telescope is to use an appropriate T ring and T adapter for your camera brand. (Check with your local camera retailer.) Other helpful accessories include an electronic cable release to operate the shutter and a right-angle magnifier that attaches to the camera’s viewfinder to assist you in focusing. Despite what you may have heard, DO NOT USE PHOTOGRAPHIC FILM — especially not medical X-rays that you may have around. While there are some emulsions which, when developed after being fully exposed, can make effective filters, it is very difficult to know if the film stock you have will be safe. Only black and white film made with a silver emulsion, fully exposed and fully developed, can be used, and only if you are absolutely sure. Color films are never safe. The safest way to view solar eclipses using items you probably have at home is to build a pinhole camera. Our colleague Natalie Wolchover of Life's Little Mysteries gives you complete, easy-to-follow pinhole camera instructions in this video. The right filter is not only very dark at most wavelengths; it tightly grips the optical tube — or the first element in the light path — so that it can’t be knocked off. Also, remember to remove your finder scope or any other secondary magnifier. Even if capped, these can get hot in extended sunlight and easily warp or crack. But if your finder scope is off, how to you align your telescope to that big bright star you want to see? Simple: look at the shadow in the ground. Move your scope around until the shadow’s footprint is smallest. Now you’re perfectly on the sun! To see these tips in action, watch this video on observing the sun with a telescope. Of course, the sun is always available online. NASA's Solar Dynamics Observatory — in geosynchronous orbit — has a better view than you and I will ever get. This smart spacecraft keeps itself pointing on the sun, down-linking 130MB of science data every second. NASA's Goddard Space Flight Center publishes SDO’s stunning images to an interactive online player. You can zoom in on active regions, fly across the flares silhouetted off the sun’s limb, spot solar tornadoes … Our star's surface is a fascinating and frightening place. NOTE:The Solar Dynamics Observatory will not be in a position to "see" the May 20 annular eclipse. Neither NASA's Solar Terrestrial Relations Observatory nor the joint ESA/NASA Solar Heliospheric Observatory will see it, either. But the Japanese-U.S. Hinode satellite will catch four discrete partial eclipses during this time. By the way, did I mention? Don't EVER stare directly at the sun! Not with your eyes, not with binoculars, certainly not with a telescope unless you have PROPER optical filters. I practice Safe Sun. So should you. Editor's note: If you snap any safe and amazing solar eclipse photos that you'd like to be considered for use in a story or gallery, please send images and comments to SPACE.com managing editor Tariq Malik at tmalik@space.com.